On Wednesday, June 27, 2018, Rossini’s comic opera “La Gazzetta” received its west coast debut at The Highland Park Ebell Club, a mere two centuries after its 1816 premiere in Naples. Produced by Pacific Opera Project, the work both looks and sounds beautiful in its staging in 1963 Paris. From Josh Shaw’s clever, accessible staging and Maggie Green’s fun costuming to the committed performances of the singers and orchestra, POP presents an amusing and persuasive case for this rarely performed work by one of the form’s most distinguished and prolific composers. “La Gazzetta” is a farce wherein Don Pomponio (E. Scott Levin), a scheming Neapolitan merchant, travels to Paris with his daughter Lisetta (Rachel Policar) in order to auction her hand in marriage, having taken out an ad in the titular newspaper announcing her availability. The action takes place in a hotel owned by Filippo (Armando Contreras), a trickster figure not unlike Figaro in Rossini’s much better known “The Barber of Seville”, who is in love with Lisetta and determined to wed her himself, spoiling Pomponio’s plans. A variety of other players become part of the action and machinations, including his confederate Madama La Rose (Jessie Shulman), the bachelor Alberto (Kyle Patterson), who falls in love with Doralice (Molly Clementz), a young woman in a similar predicament as Lisetta, her father Anselmo (Phil Meyer) eager to wed her to Monsu Travensen (Scott Ziemann). 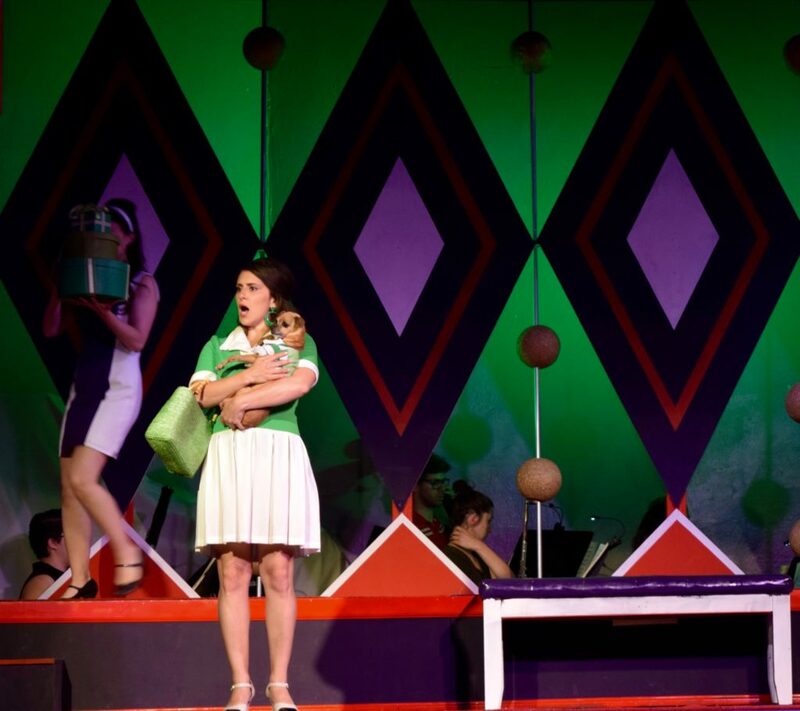 Soprano Policar remains believable as Lisetta ranges from coquettish to defiant to sad to joyful, particularly excelling in the sequence where she describes a fantastical dream to her skeptical and selfish father. Mezzo-sopranos Clementz and Shulman rise to the challenges of the piece as well, impressively nailing the high notes in the quartet “Eroi Più Galanti.” Meyer’s baritone is suitably severe as the stern father, and Zieman approaches his role as a rake with due wit and zest. The eight-member hotel staff, clad in steward and stewardess uniforms fit for a pop-art Pan Am, amusingly cavort throughout to Amy Lawrence’s smart choreography. Last, but not least, watch for the 8-year-old rescue dog Leia, who steals her one scene as Lisetta’s canine companion. Conductor Brooke deRosa leads POP’s chamber orchestra through her new and well-streamlined arrangement of the piece. Though this opera is not well known as a dramatic work, much of the music will sound familiar to opera buffs familiar with earlier and better known Rossini works such as “Il Turco in Italia”, from which the composer adapted melodies starting at the beginning with the overture, as well as from later, more successful, works like “La Cenerentola” in which the composer drew from this opera. Shaw’s clever English translation, shown in supertitles, is sharp and delivers genuine laughs, even as the convoluted plot stretches the slender thread of credibility needed for slapstick comedy as far as it can go. At various points, particularly toward the end, the machinery holding up Giuseppe Palomba’s libretto (after a play by Carlo Goldoni) seems a bit too obvious. The comedy at times ventures into territory that seems a bit darker than its light handling–certainly to a 2018 sensibility, and I suspect it may have played similarly in the 19th century–including threats of parental violence and suicide. The score being uniformly excellent, these difficult aspects of the book likely contributed more to this opera’s consignment to relative obscurity. Whatever the flaws of the story may be, they are overcome by the exuberance of POP’s staging, the excellence of its cast and orchestra, and the compositional mastery of Gioachino Rossini. A lesser work by one of the greats remains a work by one of the greats and opera buffs should not pass up the rare opportunity to see “La Gazzetta” in a full staging. It plays through July 7, 2018, at the Highland Park Ebell Club, and the final show will be streamed by POP on Facebook Live. Performances are at 8 p.m. June 29-30 and July 6-7, 2018, at the Ebell Club, 131 S Avenue 57, Los Angeles, CA 90042. For tickets, starting at $15, and other information, visit POP’s website. This entry was posted in Art, Miscellanious, Music, Theater, Upcoming Events and tagged Amy Lawrence, Brooke deRosa, E. Scott Levin, highland park, Highland Park Ebell Club, Josh Shaw, Kyle Paterson, La Gazzetta, Molly Clementz, opera, Pacific Opera Project, Phil Meyer, Rachel Policar, Rossini, Scott Ziemann. Bookmark the permalink.